← How’d you get a whole log in there? Yeah. You read that right. I believe this movie to be perfect. It hits everything you need for a family friendly film, and it does so with astronomical quality. 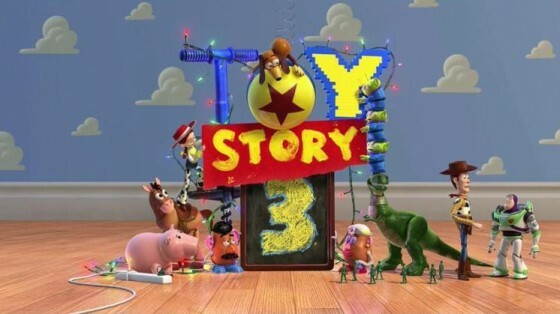 It made me nostalgic for my childhood, which the original Toy Story was definitely a part of. It doesn’t pull any punches: Toys lose their appeal after a certain age, and spend their days in boxes until there are more kids around. It made me sad. It made me happy. It frightened me and then made me laugh. It took me to highs and lows in a way that only something that is really, truly good can do. If you’ve seen the previews, you know the premise: Andy is going off to college. He hasn’t played with his toys (many of whom have already been donated or yardsaled away in the years since Toy Story 2, leaving us with just the core characters: Woody, Buzz, Jessie, Bullseye, Slinky, Hamm, Rex, and the Potato Heads and their alien children). Three days before Andy leaves, they are trying to get played with one more time before they get stuck in the attic for who knows how long, but a mishap ends up getting them donated to Sunnyside Daycare, a place where they’ll get played with as much as they want, but has a more sinister side lurking in the shadows. 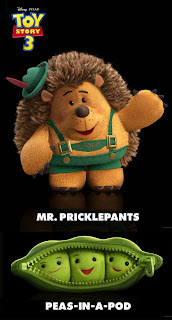 We are introduced to new characters, some that I reallyreallyreally want, like Mr. Pricklepants or the Peas in a Pod (I don’t care that they’re made for toddlers, they look awesome and I will fight anyone who disagrees or looks down on my for that, so there). LOOK AT THEM, THEY’RE AWESOME. And Mr. Pricklepants is voiced by Timothy Dalton. TIMOTHY DALTON AS A PORCUPINE IN LEDERHOSEN. 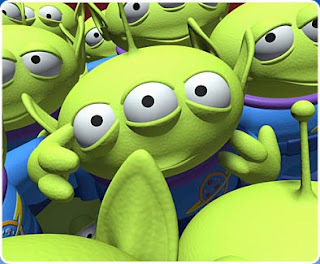 I love Pixar. I… I don’t want to tell you any more. I mean, I do, I want to tell you everything that happened so I can share with you just how awesome this movie is. I literally typed out a total synopsis right here, but I deleted it because that would kill it for you. If you’ve seen the first two, and if they had as much of an impact on you as they did on me (not many of you went to art school where “Pixar” is pretty much exactly synonymous with “You can strive to be that awesome but you can only hope to create something half as perfect” but that doesn’t mean you appreciate these films any less than I do), you need to see this movie. I’m making a declaration right now: when all of you people on the interwebs get around to watching this movie, let me know, and we’ll get together and drink hot chocolate and talk about how awesome it is and how funny that part was and how it made you cry but in a good way. It has the best possible ending. If you really really want to, just imagine what the best possible ending could be for a bunch of toys who want nothing more than to be loved and played with again, short of a Babyizer Ray shooting Andy and turning him 10 again. It’s a happy-sad ending, and it’s perfect. There really isn’t anything more to say. If you liked the first two, you’ll like this. It’s just as good, and provides closure on this series. I don’t know if this is the last Toy Story they’ll make, but if it is, I’m satisfied. And I’m serious about that hot chocolate. Take the whole family. The admission price is worth every penny. This entry was posted in Uncategorized and tagged Movie Monday, Perfect 10. Bookmark the permalink.